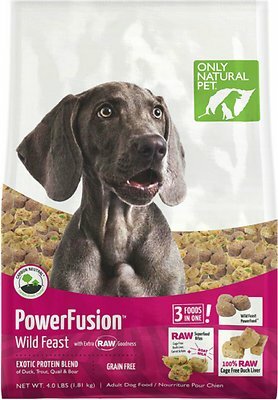 Start and finish your pal’s day with the nutritious and exotic protein blend of duck, trout, quail and boar found in Only Natural Pet PowerFusion Wild Feast. 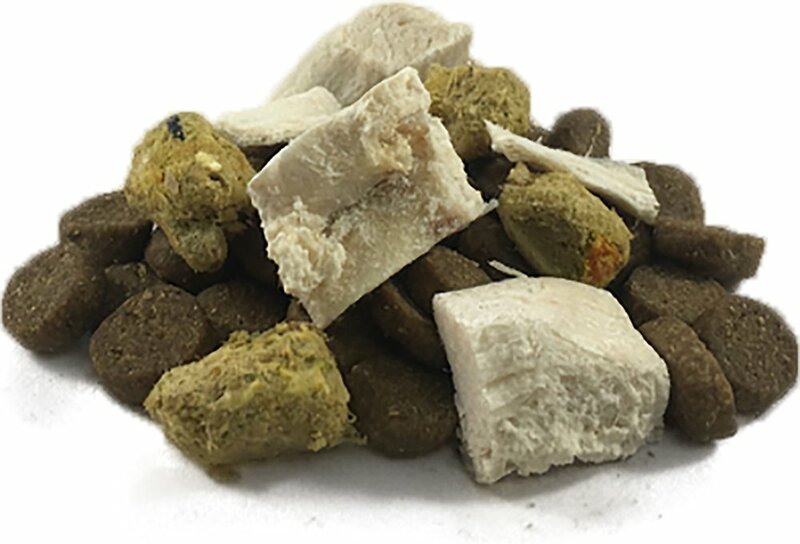 The holistically formulated kibble features raw, high-quality proteins, complex carbohydrates, healthy oils, and real vegetables and fruits that are freeze-dried to maintain their nutritional benefits. This grain-free recipe also contains delicious organ and muscle meat, plus raw goat milk to make it easily digestible for your furry friend’s stomach. The added diced, raw, cage-free duck liver provides a protein-rich tasty treat with every meal. Its exclusive PowerBoost blend coating of superfood ingredients—including pumpkins, probiotics, digestive enzymes, turmeric and New Zealand green-lipped mussels—offers an extra boost of nutritional benefits to support a vibrant, healthy and long, happy life for your furry best friend. High-quality protein from deboned duck, deboned trout, plus duck meal, goat meal and pork meal for a nutrient-rich tasty treat with every meal. Holistically formulated, grain-free kibble features high-quality proteins, complex carbohydrates, healthy oils and nutrient-dense vegetables and fruits. Raw superfood bites featuring highly digestible raw goat milk and delicious organ and muscle meat, plus digestive enzymes and amino acids. Freeze-dried meat bites add an extra boost of taste and nutrition making it an exceptionally healthy meal, with the irresistible flavor dogs love. 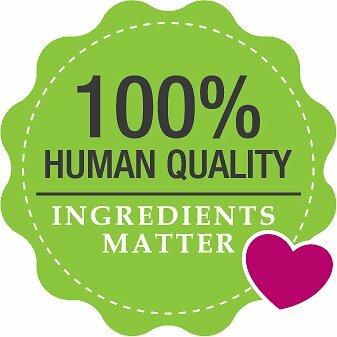 Made in the USA from globally sourced ingredients and no grains, artificial preservatives, flavors or colors. 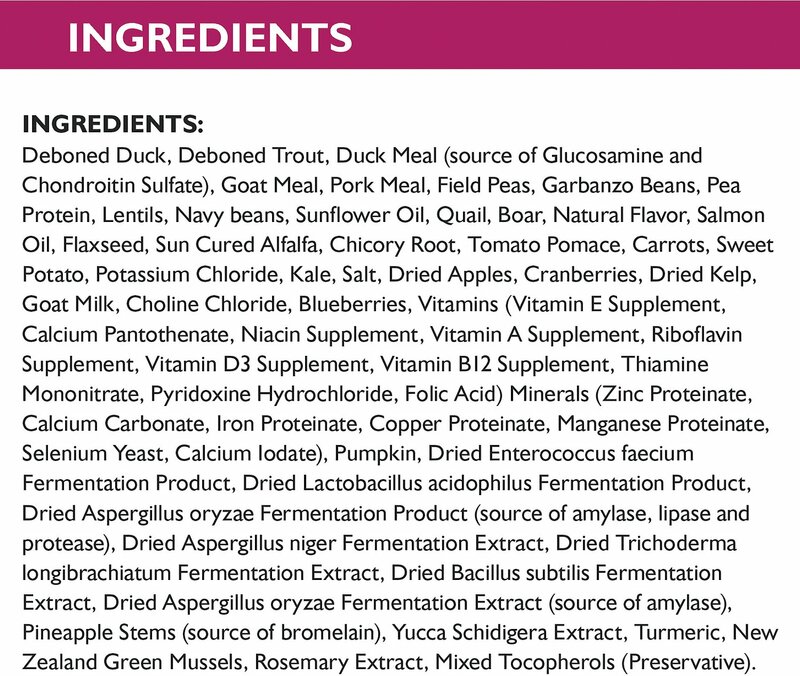 Deboned Duck, Deboned Trout, Duck Meal (Source Of Glucosamine And Chondroitin Sulfate), Goat Meal, Pork Meal, Field Peas, Garbanzo Beans, Pea Protein, Lentils, Navy Beans, Sunflower Oil, Quail, Boar, Natural Flavor, Salmon Oil, Flaxseed, Sun Cured Alfalfa, Chicory Root, Tomato Pomace, Carrots, Sweet Potato, Potassium Chloride, Kale, Salt, Dried Apples, Cranberries, Dried Kelp, Goat Milk, Choline Chloride, Blueberries, Vitamins (Vitamin E Supplement, Calcium Pantothenate, Niacin Supplement, Vitamin A Supplement, Riboflavin Supplement, Vitamin D3 Supplement, Vitamin B12 Supplement, Thiamine Mononitrate, Pyridoxine Hydrochloride, Folic Acid) Minerals (Zinc Proteinate, Calcium Carbonate, Iron Proteinate, Copper Proteinate, Manganese Proteinate, Selenium Yeast, Calcium Iodate), Pumpkin, Dried Enterococcus Faecium Fermentation Product, Dried Lactobacillus Acidophilus Fermentation Product, Dried Aspergillus Oryzae Fermentation Product (Source Of Amylase, Lipase And Protease), Dried Aspergillus Niger Fermentation Extract, Dried Trichoderma Longibrachiatum Fermentation Extract, Dried Bacillus Subtilis Fermentation Extract, Dried Aspergillus Oryzae Fermentation Extract (Source Of Amylase), Pineapple Stems (Source Of Bromelain), Yucca Schidigera Extract, Turmeric, New Zealand Green Mussels, Rosemary Extract, Mixed Tocopherols (Preservative). 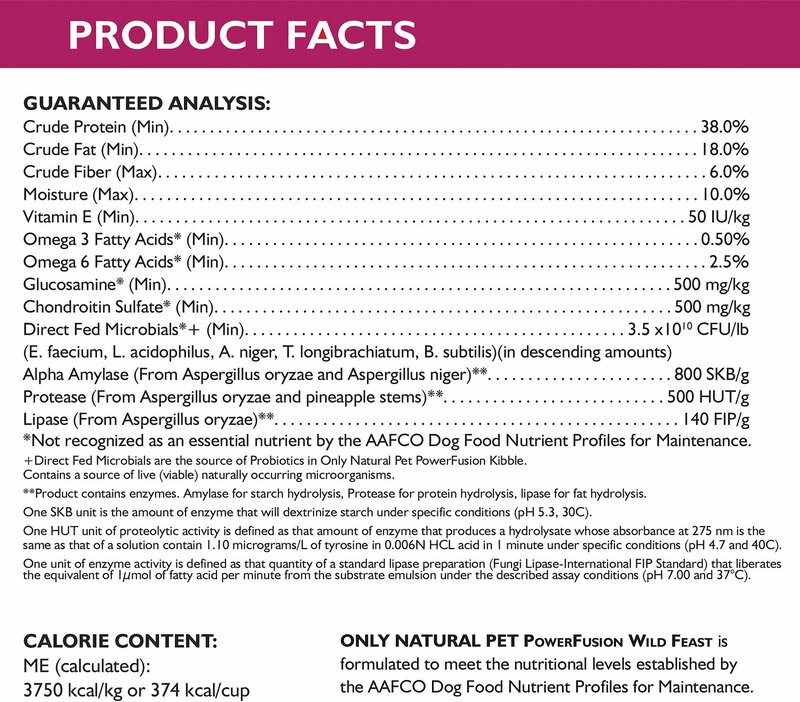 Upgrade your dog's diet with Only Natural Pet's PowerFusion. It combines high-protein, grain-free dry food with two unique raw boosters. Dogs love the meaty bites of pure raw muscle or organ meat plus raw superfood nuggets with ground meat or poultry, fruit, veggies and goat milk. 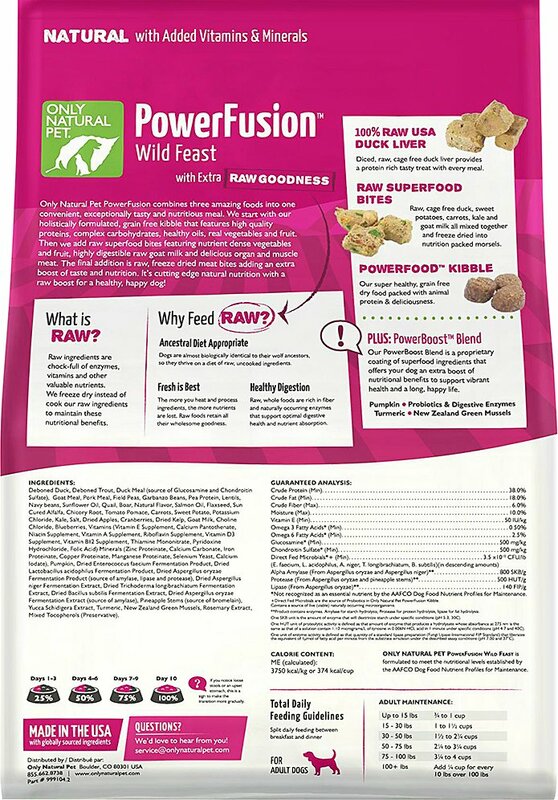 PowerFusion makes it easy to give the goodness of raw with every meal. With three tasty recipes, find your pet's favorite or rotate between them. PowerFusion features a special blend of thoughtfully selected superfood ingredients applied after cooking to offer whole-food nutritional benefits. 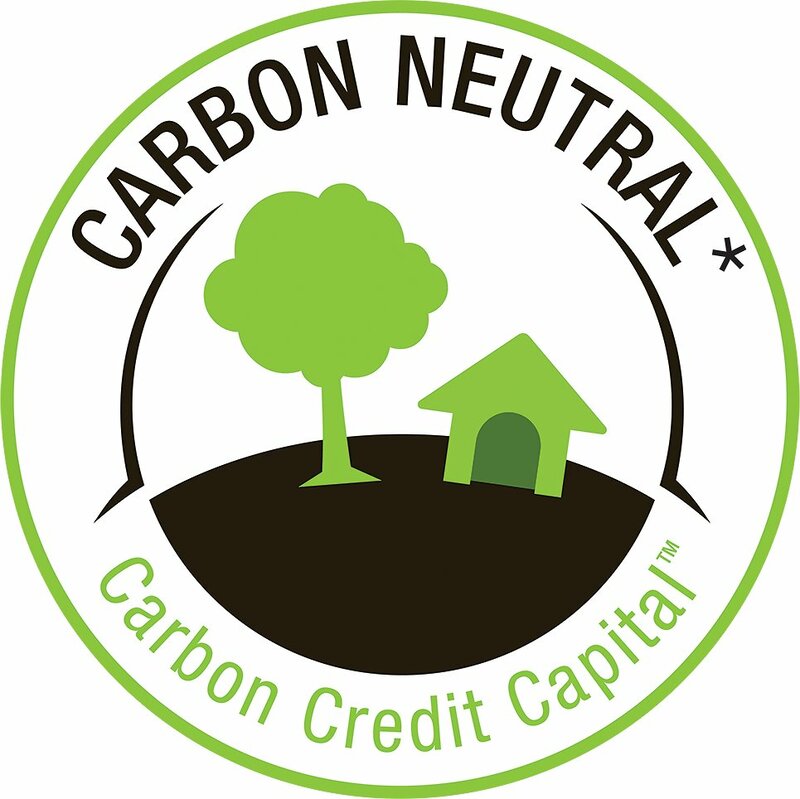 Only Natural Pet partners with Carbon Credit Capital to create a pet food that is 100% carbon neutral. From sourcing to production, 100% of the carbon generated while making PowerFusion is offset through carbon-sequestering projects. My dog loves this food. He got picky with me on other dry dog food I was giving him, so I found this one with some freeze-dried/raw pieces in it, and he loves it! The only dry food he gobbles up in one sitting. I like that the ingredients are quality and healthy. Every few months I mix this in with the fish feast to give a little added taste and my baby girl loves it! This is one of the best line of foods! 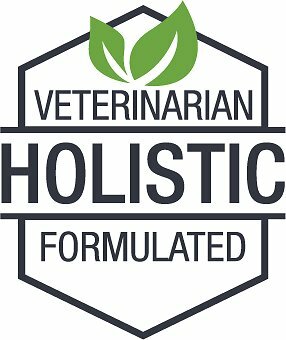 Highly recommend only natural pet food! 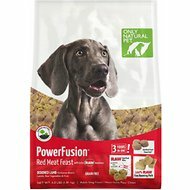 I have 4 dogs and had been mixing the first bag of PowerFusion with my previous food. I was unable to tell much from the look and feel because there is a lot of dust from the dehydrated food. At the time I went to order more, I was more than a little shocked to see the price had gone up almost 100% in 2 weeks. That came to over $80 for 18 lbs. I feed my dogs and cats the best I know how, regardless of price, but there was nothing in this bag that I felt was worth $4.45/lb. I will not be ordering more. My 11 year old beagle is loving this!! Been on it for about a year now. Wish I found it sooner! Straight away you see the effect in the coat, teeth, and attitude! Long term effects are even better! Normally, Zelda is a grazer. She will take a mouthful of food & walk away chewing. This goes on all day & I find a trail of kibble throughout the house. With ONP Wild Feast at least she stays at her feeding station & finishes her meal all at one time. Now I just have to watch her weight. My 2 dogs love this food. There are so many pieces of the raw meat bites in it and the first 5 ingredients are meat! Mookey (my puppy) loves this food it’s healthy and most important there is no ingredients from China!!! I'm on my second bag of this formula and I just bought the small breed version to try. My dogs both really like this food and so far no digestive issues. They love the freeze dried bits, though there aren't a whole lot of them in the bag. I kinda expected that though. Kobe our Boxer loves this food. It has no grain or corn and has tons of good ingredients in it. So I can honestly say that Kobe empties his bowl every time. Kobe would highly recommend this food to any fur baby out there.